Help you easily convert MP3 to MP4 with advanced tools. You might get disappointed if you want to share your amazing MP3 playlist with friends on Youtube or Facebook because social media sites like YouTube simply doesn't support the uploading of MP3 files. To properly solve this issue, converting MP3 to MP4 format first can be a good choice. In this article, we're going to show you how to convert MP3 to MP4 with ease. Part 1: How to Convert MP3 to MP4? Part 2: What is MP3/MP4? The conversion of one music format to another music format or one video format to another video format is quite easy. However converting a music file MP3 to a video file MP4 can be a daunting task if you fail to find a proper tool. Follow this process we are about to outline, and you will finish converting MP3 to MP4 within 3 minutes. Here is a comparision table. it is helpful to understand MP3 to MP4. 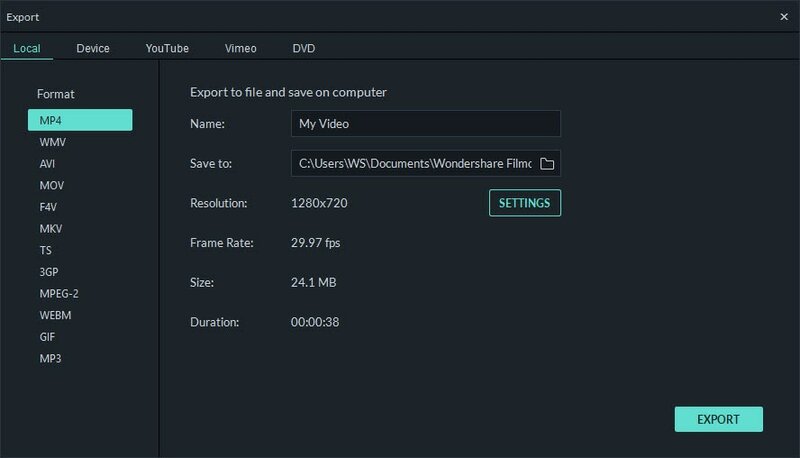 Run Wondershare Filmora that is free dowonload and choose 16:9 or 4:3 ratio as you like. Then click “Import” to select a file or a number of music files you want to convert. After a few seconds, the imported files will be displayed as thumbnails in the Media library. Drag the music files to the music timeline and adjust the order according to your desire. Now, let's convert MP3 to MP4. If you want to add more features to your files, say add an album cover or band picture, just import the images to the software and drag it to the video timeline. Then make sure the picture exposure time frame is exactly as long as the music file. Then just hit the “Create” button to start the conversion process: go to “Format” and choose MP4 format. If you want to save and play the file on mobile devices, switch to “Devices” tab and select the device from the list, then Video Editor will automatically convert the MP3 file to compatible format. What’s more, you can even directly upload the file to YouTube as long as filling in the account information. You can also find online MP3 to MP4 converters, like media.io, mp3toolbox.net. Uncompressed audio format: such as WAV, AIFF, AU etc. Lossless compressed audio format: .ape, .m4a etc. MP3 files are compressed to approximately 1/10 the original size of the music file without a corresponding decrease in fidelity and perceived audio quality. Therefore it’s rather small in size, making it very easy to download, transfer and share. Converting MP3 to any other music formats is also possible by using appropriate conversion software programs, so it it easy to conver MP3 to MP4 with a right converter. MP4 and MP3 sure sound familiar and it's possible that some may think that MP4 might be the next step for MP3. However that’s not the case. Indeed they are quite different in that MP4, which is short for MPEG-4, is a multimedia container format, used to store audio, and/or video data, as well as other data such as subtitles as well as images etc. The biggest difference between them is that MP3 can only store audio, whereas MP4 can store multiple formats of multimedia files. You see, the process of MP3 to MP4 conversion is highly simplified with Filmora because the actions are actually pretty simple even for those who are just starting to acquire computer skills. Besides converting, this MP3 to MP4 converter is also equipped with plenty of useful features, such as trim, rotate, crop video, add loge to video, change audio volume, pitch, set fade in/fade out effect, etc. Now explore more functions by yourself!